Summer is just around the corner, but it’s important that you don’t take your health for granted while you’re having fun in the sun. Staying healthy in the summer doesn’t have to be a chore. In fact, it can actually make your activities much more enjoyable. 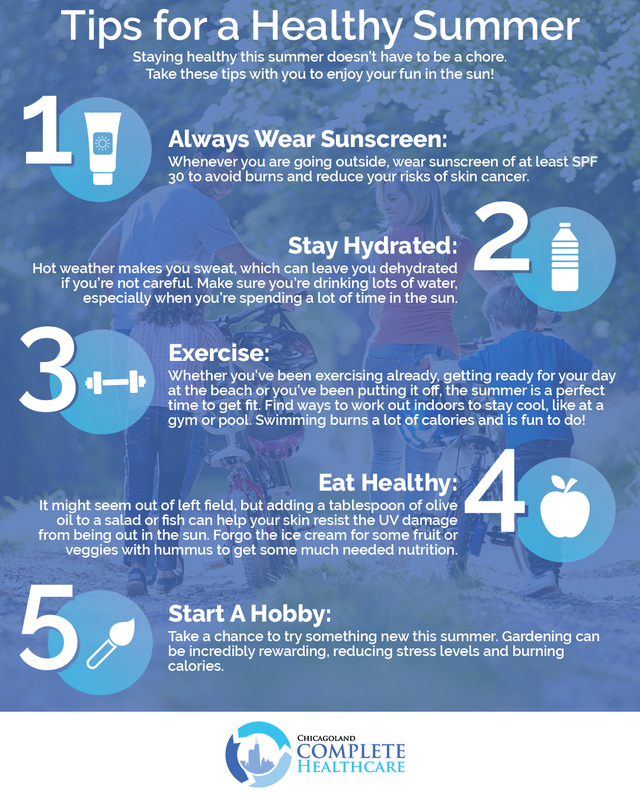 With that in mind, we’ve gathered six tips to help you stay healthy this summer. If you’re in Chicago and need medical services, look no further than Chicagoland Complete Healthcare. Whether you are looking for a new primary care physician or you need a well-woman visit, we can help out! Far too often, people will ignore putting on sunscreen when they go out in the summer. A reddish-hue to their skin acting as a signifier of their outdoor adventures. However, those sunburns can lead to skin cancer. Reduce your risk of melanoma by applying sunscreen of at least 30 SPF when you’re spending time outdoors this summer. Even when it’s cloudy out, you can still get burned by the harsh UV rays of the sun. Don’t take the risk! Protect yourself so you can enjoy your time in the great outdoors. It can be tempting to drink a lot of beer or soda while you’re having a big BBQ or pool party, but water is something you shouldn’t ignore. When we spend time in hot weather, it makes us sweat. Sweating removes moisture from your body, leaving you prone to dehydration if you aren’t drinking enough water to replace it. Dehydration causes many health issues and if you aren’t careful, you could have heat stroke. Bring along a water bottle on your adventure to keep you hydrated as you go. When you’re well-hydrated, you’ll have more energy and improved brain function, so you can enjoy your summer fun for longer. Many people spend the spring working hard on getting the perfect beach body or looking to shed their winter layer, but that can sometimes fall to the wayside once summer rolls around. Higher temperatures make it difficult to convince yourself to go outside and continue your exercise regimen. This summer, keep up with your exercise and find ways to do it indoors where you’re out of the heat and sun. Joining a gym, starting an aerobics class, or even getting together with some friends for an afternoon of exercise DVDs are all great ways to stay cool while staying active. The chimes of the ice cream truck echo through your neighborhood, thoughts of funnel cakes at the fair dance through your head — there’s an awful lot of sweet treats connected to the summer. However, when you’re looking to have a healthy summer, there are better options out there to help you avoid empty calories and large amounts of sugar. Fresh fruit is in abundance all summer long. Veggies with hummus are a great snack to have while you’re chilling by the pool. Try adding some olive oil when you’re having a salad or some fish because it contains essential fatty acids that can help your skin resist damage from UV rays. The summer is a perfect time to try something new and gain new experiences. Try picking up a new sport, such as tennis, as a fun way to exercise with a friend. Plant a garden in your backyard, full of veggies and flowers. Not only will this help you reduce stress, the act of gardening can actually burn a lot of calories. Then, once your crops have come to fruition, you’ll be more likely to eat healthy with your own vegetables. There are many hobbies that you can try out, both indoors and outside, so get experimental and have some fun. Maintaining your stress levels is just as important to your health as exercising and eating well, so it’s not something to be ignored. If you want to get the most out of your summer this year, make your health a priority. Eat well, stay hydrated, keep exercising, try out a stress-relieving hobby, and don’t forget the sunscreen so you can enjoy some summer fun. If you want more help in living a healthy and happy lifestyle, call Chicagoland Complete Healthcare. We’re here to help you get the most out of your life. We hope to hear from you soon!